It seems like only a month ago that the streets of Erie were taken over by tourists and locals alike for the city's biggest weekend of the year, Roar on the Shore. And that's because, well, it has only been a month since the last big happening to celebrate our city. But if there's one more event that truly outlines the highlights and culture of Erie, it's happening downtown August 17th through August 20th, and it's called Celebrate Erie. Celebrate Erie is a staple for locals, but those new in town or merely visiting may be curious about the kind of things that will be happening during the citywide event. Celebrate Erie takes place downtown and features free access to a number of galleries and exhibitions by local artists and vendors. A large portion of the event is rooted in promoting arts and culture, so live art demonstrations and musical performances that span a number of genres are a guarantee. On Thursday, Celebrate Erie will kick off with Taste of Erie, a sampling of some of Erie's most beloved eateries, including Three B Saloon, Brew Brothers, Primanti Brothers, Ernie's, Connie's Ice Cream, The Brewerie at Union Station and Odis 12 Bar & Grille. Taste of Erie will be spread out along Perry Square, just within strolling distance from The Artist Colony, a pop-up exhibition where you can enjoy art from some of the our city's most thought-provoking artists. Don't worry; the little ones haven't been forgotten. Celebrate Erie is a family-friendly event that will feature kid-oriented entertainment spanning two city blocks (Eighth Street to 10th Street). The Kids Zone will host a multitude of interactive activities, including the Kids Construction Zone presented by David's Landscaping and Design, dedicated to education and "enticement of the industry." 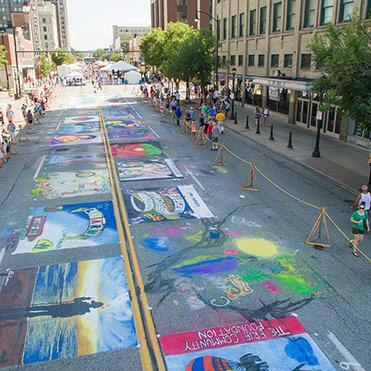 One of the most popular features of the annual celebration is the local Chalk Walk, in which State Street is filled with chalk murals by the area's most talented artists. After three days of colorful creation, a vote is held and winners are announced Sunday evening on the Celebrate Erie Main Stage. And on that very stage, there will be no shortage of music all weekend long. On Thursday, rhythm and blues legends the Spinners will headline. The vocal group, also known as the Motown Spinners or the Detroit Spinners, has been active since 1954. On Friday, get ready for an unprecedented evening of rock royalty, as Blue Öyster Cult will perform, followed by Dennis DeYoung and the Music of Styx. Blue Öyster Cult is noted for their blues-inflected brand of psychedelic proto-metal, churning out hits such as "Godzilla," "Burnin' for You," and "(Don't Fear) The Reaper." Singer and keyboardist Dennis DeYoung was one of the founding members of the band Styx, and is credited with seven of the band's eight Billboard Top 10 Singles, including "Babe," "Mr. Roboto," "Lady," and "Come Sail Away." On Saturday, the main stage music begins at 4:15, with Sam Hyman, Ruby Port Band, and Erie All-Stars setting up the scene for 3 Doors Down. Known for songs such as "Be Like That," "Loser," and their breakout hit "Kryptonite," these alternative rockers were a fixture of the early 2000s charts. Many more artists will perform on the Tenth Street stage throughout the weekend. To better grasp the scope and draw of an event the size of Celebrate Erie, I decided to speak with someone who may have a different perspective than that of the average patron: performer Sean Dunn of Sean Patrick and the Newgrass Revolution. "I always enjoy playing locally because this is where I got my start, and without the people [of] Erie, I would not be where I am in my career," Dunn says. "Events like Celebrate Erie are very important to remind Erie residents of the incredible talent in this town." This is Dunn's second year performing at the event after playing at the Erie All-Stars Woodstock tribute a few years back. He describes his music as newgrass, or "amplified progressive bluegrass," and says that growing up in Erie affected his sound strongly. "I draw from very personal experiences, as well as my surroundings [when songwriting]," Dunn says. But perhaps most importantly, if you find yourself attending Celebrate Erie for even just one night, make sure it's Sunday, August 20th, when Zambelli Fireworks presented by Presque Isle Downs and Casino will be shot off during the event's grand finale. Celebrate Erie has consistently and traditionally been one of the Erie's most talked-about events, but fortunately, this year, there are even more new activities to discover throughout the downtown area.